1. Dogfight by Rockville Musical Theatre at Arts Barn at Arts on the Green. “The opening number, “Some Kinda Time,” was a fun way to start the show and highlighted the camaraderie of the Marines that carried throughout.” – Maria Materise. Synopsis: It’s November 21, 1963. On the eve of their deployment to a small but growing conflict in Southeast Asia, three young Marines set out for one final boys’ night of debauchery, partying and maybe a little trouble. But, when Corporal Eddie Birdlace meets Rose, an awkward and idealistic waitress whom he enlists to win a cruel bet with his fellow recruits, she rewrites the rules of the game and teaches him the power of love and compassion. Eric Jones as Eddie Birdlace and Megan Evans as Rose Fenny in “Dogfight.” Photo by Rockville Musical Theatre. 2. Lucky Stiff by Silhouette Stages at Slayton House. “… a wonderfully amusing and heart-warming musical with both phenomenal acting and singing.” – Liz Ruth-Brinegar. 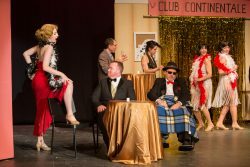 Synopsis: Based on the novel “The Man Who Broke The Bank At Monte Carlo” by Michael Butterworth, Lucky Stiff is an offbeat, hilarious murder mystery and musical farce complete with mistaken identities, six million bucks in diamonds, and a corpse in a wheelchair. The story revolves around an unassuming English shoe salesman, Harry Witherspoon, who is forced to take the embalmed body of his recently murdered uncle on a vacation to Monte Carlo. Should he succeed in passing his uncle off as alive, Harry stands to inherit $6,000,000! “Lucky Stiff” featuring Alyssa Bell, Rob Wall & Mike Cornell. Photo provided by Silhouette Stages. 3. 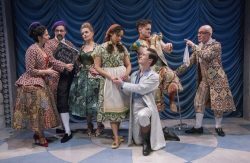 Fickle: A Fancy French Farce at Olney Theatre Center. “…filled with plenty of delightful cheesy gags and surprises.” – Mark Beachy. Synopsis: Rising American playwright Meg Miroshnik turns her sharply comic eye on one of the funniest French comedies of the 18th century. What happens to poor Harlequin when he finds himself kidnapped by an all-powerful Prince with designs on his fiancée, the faint-hearted peasant Silvia? Will Harlequin speak truth to power and tell the Prince to go hang? Prepare for disguises, mistaken identities, palace intrigues and improbable romance in this delightful comic romp that ends, of course, in more than one surprising marriage. 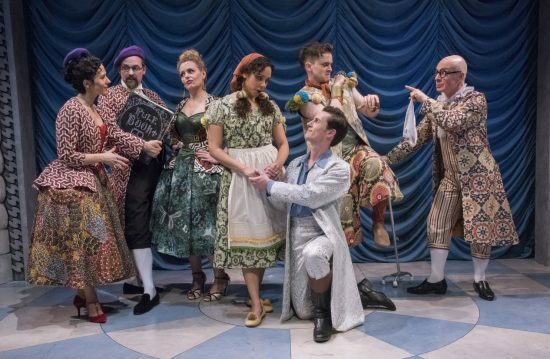 The cast of Meg Miroshnik’s “Fickle: A Fancy French Farce” at Olney Theatre Center, a new adaptation of “The Double Inconstancy,” a 1723 comedy by Pierre Carlet de Chamblain de Marivaux. Photo by Stan Barouh. 4. Henry The Fifth at Cohesion Theatre Company. “It works, and the story works as well…” – April Forrer. Synopsis: “Henry The Fifth” is Shakespeare’s epic tale of one of England’s most celebrated kings and the famous battle of Agincourt. When placed in the context of ancient rights and God-given purpose, we see adventure and heroism in Henry’s story. 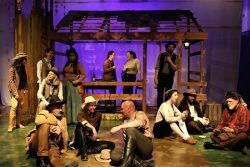 Directors Alice Stanley and Jane Jongeward will seek to strip away this glorified portrayal of the violence of war by setting the piece in backwoods and rolling hills of nineteenth-century Appalachia. 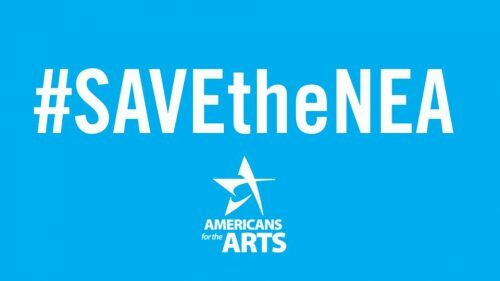 Drawing on historical family feuds and traditional religious bluegrass music, the production will spur the questions: What is the nature of violence when glory is discounted, and how do we reconcile the long history of violence with faith? The cast of ‘Henry The Fifth.’ Photo provided by Cohesion Theatre Company. 5. Bye Bye Birdie at Artistic Synergy. 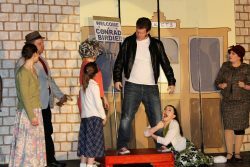 “Go see “Bye Bye Birdie”….” – Timoth David Copney. Synopsis: When Conrad Birdie, the biggest Rock & Roll star of the 60’s, is drafted into the Army, songwriter Albert Peterson, decides on a brilliant scheme to promote one hit song to make his fortune. He convinces Conrad to bestow “one last kiss” on a small-town fan on national television. However, with the intrigue of his mother, the frustrations of his girlfriend, the small-town gossips, and one not so wholesome rock star, even the best schemes don’t go as planned. Matt Peterson as Conrad Birdie and Olivia Winter as Ursula. Photo provided by Artistic Synergy.